The Two Disc Special Collector's Edition on Amazon.com! Comparison between the European Version and the American Version. It is not at all common knowledge that of Star Trek IV there exist two versions - the original version and the European version. Star Trek III was not as successful in every country as it was in America. In some countries the movie even was released on VHS only. So the producers feared that the sequel might confuse people (presumably taking the audience for complete idiots). So for Europe and South America a prologue summarizing the two prequels has been produced. This prologue is not contained in the original version. But that was not all, for in the aforementioned countries the subtitle "The Voyage Home" became the main title and the title sequence had been edited as well. The changes to title and title sequence were taken back for th DVD but the prologue remained. Unfortunately, because we only had a very bad VHS copy of the changed title sequence, there will be no screenshots for these particular alterations. Before the movie itself a prologue is shown that is not shown in the original version. Captain Kirk records a logfile in which he summarizes the events of the first two movies. He talks about his crew and how Spock died, as well as Project Genesis. Then we see Ambassador Sarek telling Kirk that Spocks spirit is still alive. Kirk wants to use the Enterprise to get Spocks body back and even captures the ship to do so although this means the end of his career. But Klingons await on planet Genesis and the Enterprise is eventually destroyed. The crew finds Spock, who has been resurrected, and uses a captured Klingon ship to flee to planet Vulkan where spirit and body are reunited before Kirk explains his reasons to Spock. Kirk closes the file with saying that their punishment for insubordination awaits them on Earth. The prologue runs 3 minutes and 24 seconds. In the original version, before the the Paramount logo we see a dedication to the victims of the Challenger disaster that took place not long before the movie was finished. The dedication has been re-inegrated for the DVD releases and is now shown between prologue and opening credits. The dedication runs 12 seconds. For the old European version the title sequence had been changed. 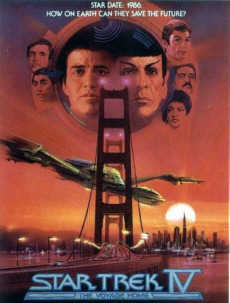 Because the Paramount logo was also shown along with the prologue it is missing here and the first text screens had been replaced by the "new" title with the original "Star Trek" written under it in smaller letters. The audio had been changed as well so that the music starts with the beaming noise of the original title. All these changes have disappeared for the DVD and the original title sequence is now used - and now the Paramount logo is shown twice. Unfortunately, we have no screenshots in this case for the reason mentioned in the introduction.